2. A gate with a small opening for the cats would be terrific but the throne room has only a 24" opening nd all gates are too wide except something we found in the UK. not gonna happen. 3. Again we would try something to put up a bit higher so the cats could get under but our opening is too small. 4) I clean the litter tray often but sometimes Puppy gets to the treats before I can and then he poops inappropriately . The pets (2 cats, 2 dogs) all sleep in the master with us. We are thinking about crate training the new pup but even if he is crate trained we LOVE having him in the bed with us. He usually stays in one place the whole night unless he smells treats in the litter tray. The other dog is crate trained but he doesn't bother the litter tray and sleeps in his little bed beside me all night. Your dog has a condition called coprophagia . Have you spoken with your vet about this? My Ragdoll kitty is now 16 yrs. of age and her litter box has always been in a separate room (laundry rm. etc.) About 10 yrs. ago I had a beautiful show quality Poodle, smart as a whip. Well.... he had this same problem. In an attempt to stop his visits to her litter box, my husband put a simple chain lock on the back of the door to the room ... put it on backwards ... which left the door open about 8" only. The dog could not get in there, but the kitty could. Oh, yes, he would try and it was really annoying! I had to put the cat food on the vanity so she could jump up and eat, or he would eat hers and his. Our vet said there was not much we could do about it; and we felt it was too disgusting to put up with for the life of either kitty or the dog. And I certainly didn't want the dog giving 'kisses' to my grandchildren! So......... unfortunately, we had to find another home for the dog in a family where he would be the only pet. 8 yrs. have gone by and they still have him; and they were told about the coprophagia, and he doesn't go outside unless leashed. I doubt there is anything at all that you can do about this problem. And, putting a reverse chain or gadget on the door will only allow the cat to get in and out; not a small dog -- unless he 'outgrows' the entry space and by then he may cause damage to your woodwork etc. trying to get in there. 99% chance though that he will never outgrow his filthy habit. Best advice from this end is to have a serious talk with your vet. Our two Golden Retrievers did this. In fact one choked on the "litter covered treats" and we almost lost him. We now put fireplace screens around the box so they cant get to it. Plus the one that almost died is afraid of things like that so he won't even go near the screen. I love the item that was posted here and may look into that as well...however our home is so open concept that we really don't have many enclosed spaces to do that. I used to have a household with 2 cats (3 at one point) and one litter-box foraging dog. My solution was pretty simple: I got a covered litter box and turned it around to face a wall, with enough access space for the cats, but not enough for the dog. Dog soon lost interest in attempting to find her own treats. 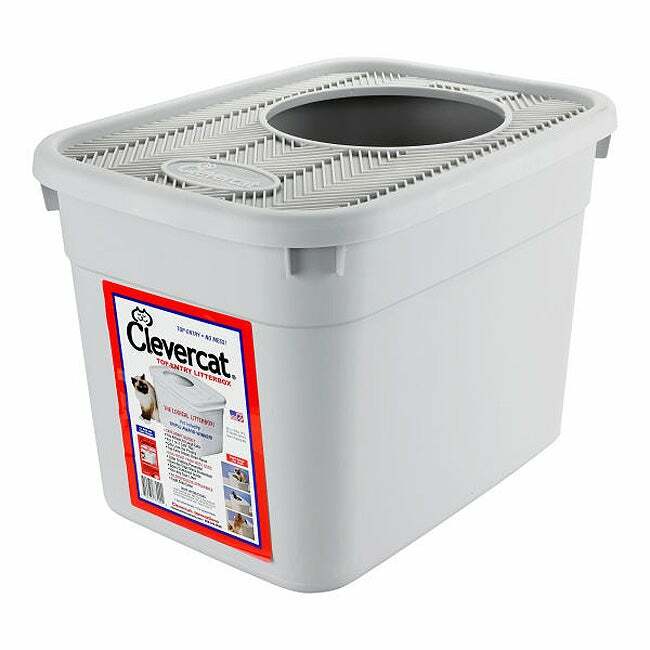 I use a "Clever cat" litter box. The dogs have never been able to get at the cats poop.